From the main screen, click the "Edit" button on the left side of the screen. Ballpark - enter the name of the field or park where the game is being played. This is used for "Welcome to <ballpark> and today's game featuring..."
Team name & Mascot fields. High school teams have mascots like "Greenville Bears" so you would enter "Greenville" for Team name and "Bears" as the mascot. Many travel teams, like "St Louis Recruits", don't really have a mascot so put all of it in Team name and leave the mascot blank. This is the scoreboard display for this team. Keep names to 9 characters or less. Press the "Check Pronunciations" button to verify pronunciations and change phonetics accordingly. This is also where you can store and load a team for recall (including player info). Click the button "Check Pronunciation"
Assign the green position buttons to each player in the field. In Ballpark or Wiffle Ball mode, enter the other team info by toggling between the home and away team's lineup. Press Home / Away heading in the top left of the screen to toggle back and forth. Once you have the Away team selected, click the Edit button and repeat the steps above for editing the Team info and adding players. In Travel Team mode, press the "Edit" button and then press "Edit Game" to enter the information about the opposing team. These fields are identical to the "Edit Team" info. Remember: all of these spellings are phonetic spellings EXCEPT for the Scoreboard Display Name. IMPORTANT NOTE: Apple Music and streaming songs from iCloud are not allowed in Gametime Announcer. 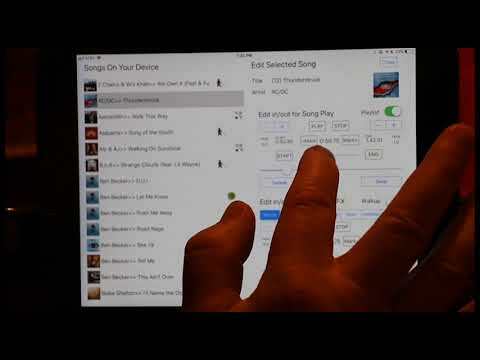 All music must be OWNED and downloaded to your iPad. To edit the playlist and walkup songs, go to the Settings page. At the bottom right next to the red STOP button, press the Playlist Icon. In the top section, flip the switch next to the word "Playlist" to designate this song as part of your playlist. Click the "Play" button and listen to this song...if the intro of the song is too long, you can "Mark" a starting point other than the beginning of the song. There are two sliders, the bigger one allows you to move anywhere in the song. The smaller one allows you to move forward or backward 1.5 seconds to fine-tune the edit point. Press the MARK button on the left to set the start point. If you would like to add a bit of fade-in, click the + above the FadeIn value to increment the fade-in by 0.5 seconds. The fade time can be from 0.0 to 5.0 seconds. An end to the song can also be marked if you prefer the song end sooner than the actual ending of the song. Again, set the fade-out by increase (+) or decreasing (-)the value. Click the "START" button to hear how the song will start. Click the "END" button to hear how the end of the song will sound. Click the Save button once you are satisfied.